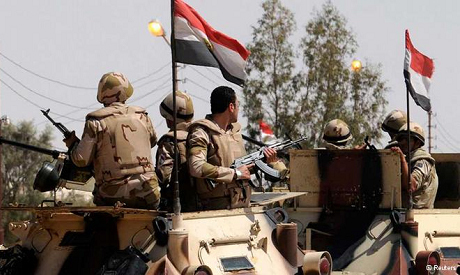 Egyptian troops on Sunday killed a militant fighter and arrested several of what they described as some of the most dangerous militants in the Sinai Peninsula. Raids on the hideouts of suspected Islamist militants in the North Sinai towns of Al-Arish, Sheikh Zuweid and Rafah, killed one and netted 20 arrests, a military official confirmed. The raids on Sunday were the latest in a broad military campaign to weed out Islamist insurgents who have expanded their activities in the border region following the ouster of Islamist president Mohamed Morsi last summer. Army troops and police killed an Islamist militant and arrested three of the most dangerous fighters in the region, military spokesman Ahmed Ali said in a Sunday statement. Almost 500 people, mostly policemen and soldiers, have been killed since by militant attacks since Morsi’s ouster. In recent months, the violence has spread from Sinai to the capital Cairo and the surrounding Nile Delta region. Egypt has poured troops and armour into the peninsula to combat the growing insurgency while waging a sustained crackdown on Islamists elsewhere — principally Morsi's Muslim Brotherhood group. Air and ground offensives by the military have killed dozens of fighters. Hundreds of others have been arrested and hundreds of militant hideouts and arms caches have been destroyed.